. 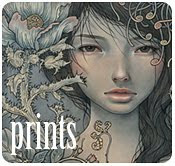 audrey kawasaki .: . Midnight Reverie . see all piece from my recent show 'Midnight Reverie' at Jonathan Levine Gallery. all pieces oil, acrylic, and graphite on wood panel. Gorgeous works!!! As always Darling! gonna come and see it next weekend for sure! It is difficult to find the words, but your creativity inspires! Insanely inspiring! Oh, I found all kitties. :) Your all works are mysterious. Congrat. Absolutely stunning pieces. I love "Make Believe". Hope it'll be available as a print someday. Totally love every single piece of yours, you inspire me so much since the very first time I knew about you! Absolutely love your art, Audrey! My favourite here is "Deep Waters"! Will you exhibit in Australia? Just love this post! It's filled with paintings to fall in love with!!! deep waters and wandering star, are you a fan of portishead? Something that strikes me with these paintings is that they have a rougher and more "to the point" air to them compared to the earlier works. The black colour and the patterns that seems to be the theme through out each artwork is bold and modern, yet there is un undertone of what was. A sort of "longing for" but at the same time embracing the future. Personally, I think that all of them are equally as beautiful as the artist herself! I appreciate all! Hey, Audrey, keep it up! You're doing great! Such a beautiful collection! Your work never ceases to amaze me. Hm, I don't have a Facebook account so I can't vote. But I'd like to share my preferences of the collection of your paintings, which would be "Shadows" and "Deep Waters". I'm looking forward to seeing which painting will be printed and sold. saw this today, right on the last day of the exhibition. wish i could stay longer to get to know what's behind each pair of eyes. ok nvm i found your new paintings in this post... :D Audrey, I wanted to make a request, is it possible for you to make a list and show some of the books you use for research for your paintings? I've been trying to find some online (like the ones you show on this post) and in others post related to anatomy, Japanese mythology etc, animals, etc... I've been trying to find in book shops where I live but I haven't been able to find anything alike, I want to start to draw/painting, because I wish to change my media from digital to traditional, this would be a great help, thank you and I keep loving your paintings, they are always so beautiful and intensive.
. exclusive gallery print .